If this card is Link Summoned: You can add 1 “Salamangreat Sanctuary” from your Deck to your hand. If a “Salamangreat” card(s) you control would be destroyed by battle or card effect, you can banish this card from your GY instead. You can only use each effect of “Salamangreat Balelynx” once per turn. Salamangreat Balelynx is the Link monster that gets the Link Summoning going for Salamangreats. Needing only one Level 4 or lower Cyberse monster, you will always be able to get this to the field unless you have only tech cards in your hand. Search out Sanctuary from the deck to the hand on the Link Summon, allowing you to start reincarnation link summoning and get the deck really going. Use Balelynx to go into your stronger Salamangreat Link monsters and set up some protection for your graveyard. Each Balelynx in your grave can be banished to save a Salamangreat from destruction. The small ATK doesn’t matter, it is a great startup for the decks strategy and is a must. Salamangreat Balelynx is a great combo starter. You use any Level 4 or lower Cyberse monster to Link Summon this Fire Cyberse-type Link Monster with 500 Atk and with one Bottom Arrow. Upon Link Summon you can search Salamangreat Sanctuary out of the Deck to your hand. I wish It said a Field Spell Card that lists Salamangreat or something just in case they retrain the card in the future. That being said a free search for a necessary Field Spell is great. While in the grave, Balelynx can banish itself to protect Salamangreat cards from destruction. Each effect is once per turn and the second effect is particularly useful since Salamangreat Balelynx will be in the grave from all the Link Climbing the deck does. It looks cool too. We got more Links in the archetype, so it’d be fitting to look at the last one the TCG currently has at the moment, Salamangreat Balelynx. Balelynx is a Link-1 FIRE Cyberse with 500 ATK and an arrow pointing down. ATK is low on a Link-1 as always but you’re likely using it as Link Material for something bigger anyways, FIRE and Cyberse are nice in the archetype, and that arrow is very nice on a Link-1. The summoning requirement is any Level 4 or lower Cyberse monster, which leaves the door open for so many options beyond the archetype like Lady Debug or Flame Bufferlo to be played in the deck just to summon this maybe. Upon being Link Summoned, you can add a Salamangreat Sanctuary from your deck to your hand. Sanctuary is basically the heart and soul of making your cards live without having to invest too many resources, so having a searcher for it was perfectly fitting and helps you not have to play as many copies of said Sanctuary. If a Salmangreat card(s) you control would be destroyed, you can instead banish Balelynx from the graveyard instead. Great protection to have as you’d like to keep your cards on the field, especially Sanctuary and Sunlight Wolf. The ease of getting this in the graveyard helps as well since it’s likely being used as Link Material after being summoned in the first place. Both effects are a hard once per turn, even though that destruction protection would be nice to have multiple times in a turn since Sunlight Wolf only has 1800 ATK, but that’s fine. 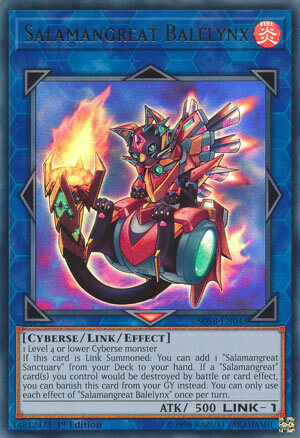 Balelynx is still an important piece of the deck to get to the heart and soul of Salmangreats and its ease of summoning lets you experiment with more Cyberse monsters, play two or three because sometimes you might need to Reincarnation Link Summon this just to get plays going with Gazelle. Art: 4/5 Awww, I want to pet the kitty…. ow, it burned me. Coming back upon Links, we look today for midweek at Salamangreat Balelynx. Simple card here, Fire, Cyberese, Link 1 requiring a Level 4 or lower Cyberese Monster, with 500 attack and a solitary arrow pointing directly below itself. So Link Summoning this gets you a Salamangreat Sanctuary from your Deck. That’s a free card, and that’s good, but I’m still not entirely for that card anyway. That’s an incredible protection effect just by removing itself. Protection from Battle and Effects from one card is just great. This card is obviously easy as all hell to get in the Graveyard with its 500 attack. Like most of the smaller theme cards, this is a combo piece too, to help you get things going. With this kind of protection, two or even three are necessary in your Deck. Art: 5/5 Very pretty, a lynx is a cat, for the uninformed, and I like the glowing aura, I love the fire tail, still digging the bright backgrounds. Love the little scooter it seems to be on. Almost cute, if not so evil looking. Next articleNEW from Yu-Gi-Oh! TCG in April 2019!